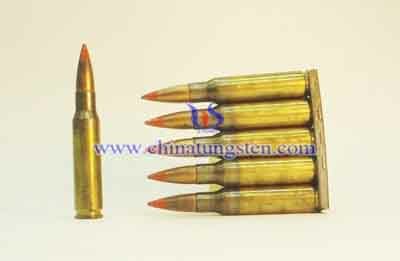 The medium and large calibre ammunition is derived from tungsten. This extremely dense, heavy metal is about 1.7 times heavier than lead, and far more difficult to deform than steel. It is excellent for use in armor-piercing. Because of tungsten's great properties and strength, it is very useful for piercing deep into synthetic, metallic targets. Tungsten alloy armor-piercing medium and large caliber ammunition possess characteristics of compression resistance and non-tensile, when it penetrate armor, nearly no deformation occurred, and form fragment after punching through armor plates, increase killability and combustion effect, besides are more than armor-piercing made by other materials. The AP shell is now little used in naval warfare, as modern warships have little or no armor protection, but it remains the preferred round in tank warfare, as it has a greater "first-hit kill" probability than a high anti-tank (HEAT) round, especially against a target with composite armor, and because of higher muzzle velocity, is also more accurate than a HEAT round. Tungsten alloy medium and large caliber is used to penetrate hardened armored targets such as ballistic vests, vehicle armor, concrete, tanks, and other defenses, depending on the caliber of the firearms. Armor-piercing ammunition consists of a penetrator constructed of hardened steel, tungsten carbide, or depleted uranium, enclosed within a softer jacket, such as copper or aluminum. 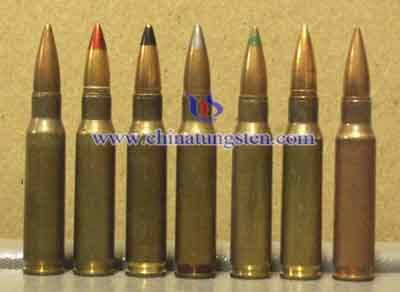 If you have any other questions about tungsten alloy ammunition , please feel free to contact us by email: sales@chinatungsten.com or call: 00 86 592 5129696.